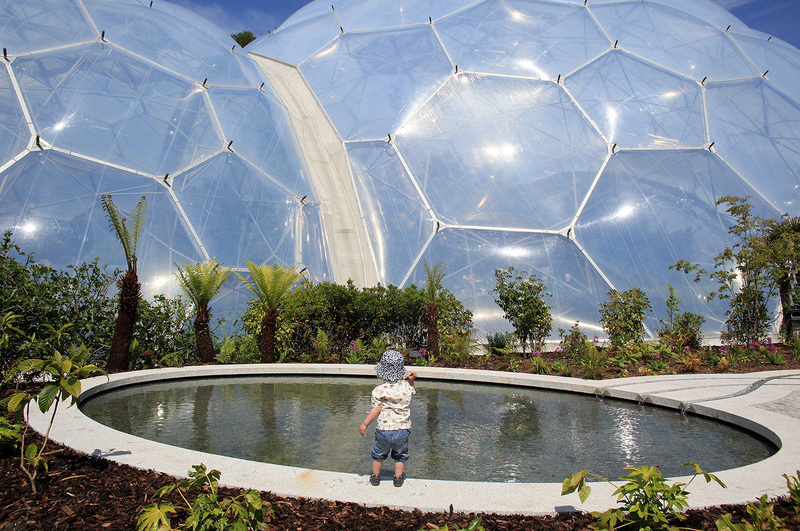 A toddler explores the The Sense of Memory Garden at the Eden Project in St. Austell, Cornwall, England, May 31, 2012. By Charlotte Middlehurst, a London-based Deputy Editor at chinadialogue. This article was first published by chinadialogue. Built on the site of an abandoned clay pit, the Eden Project has never been short of grand vision. Its iconic biomes house the world’s largest captive rainforest and have become a landmark of the local Cornish countryside. Since opening 16 years ago, the project has become one of the U.K.’s best-loved tourist attractions, attracting 19 million visitors and contributing U.S.$2.2 billion (15 billion yuan) to the regional economy. Enter the garden and at once you are dwarfed by giant trees, such as kapok and balsa, and other flora and fauna from all over the world. Its plant houses, made from a special plastic (ethylene tetra­fluoroethylene copolymer), resemble renderings of a lunar colony. Unsurprisingly, this extraordinary landscape has garnered many epithets: horticultural expo; cathedral to economic botany; mind-blowing classroom. But founder Sir Tim Smit sees it as a place where people can connect with each other and with nature through a shared cultural experience. Now that vision is being exported to China. In 2020, Eden will open its first overseas project and has chosen the sunny, coastal town of Qingdao, eastern China, known for its good weather, beaches, and annual beer festival. It will be built on a large area of reclaimed and environmentally-damaged land, originally used for salt production and prawn breeding. The project will have a water theme and will cost in excess of $130 million (880.5 million yuan). It’s expected to draw visitors from Japan, Korea, and elsewhere, as well as from China. The Chinese partner is the real estate company Jin Mao Holdings, owned by the state-run Sinochem Group, whose previous projects include the 88-floor Jin Mao Town in Shanghai, formerly China’s tallest skyscraper. At a glance, China might seem like an odd choice for Eden’s first foray overseas given the country’s ongoing pollution crisis and low penetration of social enterprises. However, the project’s arrival signals a shift in attitudes across the country and a growing market in green tourism. China’s leaders have declared war on pollution and made environmental education a national priority. But using cultural attractions as a means by which to do this is novel. That said, Eden’s narrative of transforming a site of waste into one of ecological and economic plenty aligns neatly with President Xi Jinping’s strategy to pursue “ecological civilization,” a long-term vision for a greener, more sustainable China. The latest Five-Year Plan for economic growth (2015-2020) set aggressive targets to tackle carbon emissions and adopt clean energy. Carbon intensity is expected to fall by 18 percent by 2020 compared to 2015 levels; while the country’s share of renewables will rise by 15 percent. Internationally, China is already the world’s largest investor in renewable energy technologies. “What I am seeing in China now is a culture emerging from a development model into a spiritual model; that is opening itself up to the realization that development is not worth it if your world is not worth living in,” says Smit, when we visit him in his office in Cornwall. At the same time, the country is developing its tourism sector as a major driver of economic growth. By 2020, investment in tourism is expected to grow to two trillion yuan (U.S.$147 billion), with the sector contributing more than 12 percent of GDP, according to the State Council. Eden’s arrival ties in with the twin goal of greener growth and increased tourism. Qingdao is the first of three Eden projects planned in China. The second will be in the city of Yan’an in Shaanxi province, central China. Located on the Loess Plateau close to the Yellow River in an area with a long and tragic history of flooding, the project will focus on sharing knowledge around soil and agricultural systems. The structure of the Yan’an project will be built using clay and other local materials, a departure from the steel and polycarbonate synonymous with Eden’s other sites. There will be a strong emphasis on scientific research and technical training in farming techniques and soil remediation. Yan’an is also where the Red Army’s Long March ended in 1935; a cultural detail that has not been overlooked. A third project is in the pipeline. So Why Move to China? “China is the most populous country on earth. It has a political system that has demonstrated itself capable of taking a large number of people on a journey. If you are taking a planetary view, to create awareness and make the huge institutional change needed to cope [with environmental threats], what is happening there is far more exciting than what has been happening in Europe,” says Smit. As well as tapping into a burgeoning eco-consciousness, Eden is harnessing a rise in experience-centered tourism. The study also found that consumers are generally becoming pickier about the experiences they go for, with over half of those surveyed planning to spend more of their income on leisure and entertainment. Finally, it revealed that travel is increasingly being used to reinforce familial ties: 74 percent of respondents said that trips away from home help them to better connect with family. These trends have already led to a rise in entertainment tourism. Last year, Disneyland opened its first mainland park in Shanghai. While Wang Jianlin, Chairman of property development company the Wanda Group, plans to build 15 multi-billion dollar theme parks across China by 2020. “There is a really swift change going on culturally from provincial and inward-looking to an outward-looking, younger generation who within the space of a year are changing their views. Culturally, there is a hunger for different types of experiences,” says Smit. China’s provincial governors are also alert to the opportunities of overseas partnerships, particularly those that create jobs, up-skill the labor force, and green their cities. Dr. Mike Maunder, an expert in plant conservation and horticulture at Eden, has been involved in getting the Yan’an project off the ground. “The mayor’s office was anxious that the project deliver economic gains, not just through tourism but also through supporting agriculture and building jobs that promote the regeneration of resources rather than accelerate the erosion of resources,” says Maunder of a visit to China. The backdrop to Eden’s new partnership is a shifting geopolitics between East and West, which has seen President Donald Trump withdraw the U.S. from the Paris climate agreement, while China is increasingly looked towards to fill the leadership void.